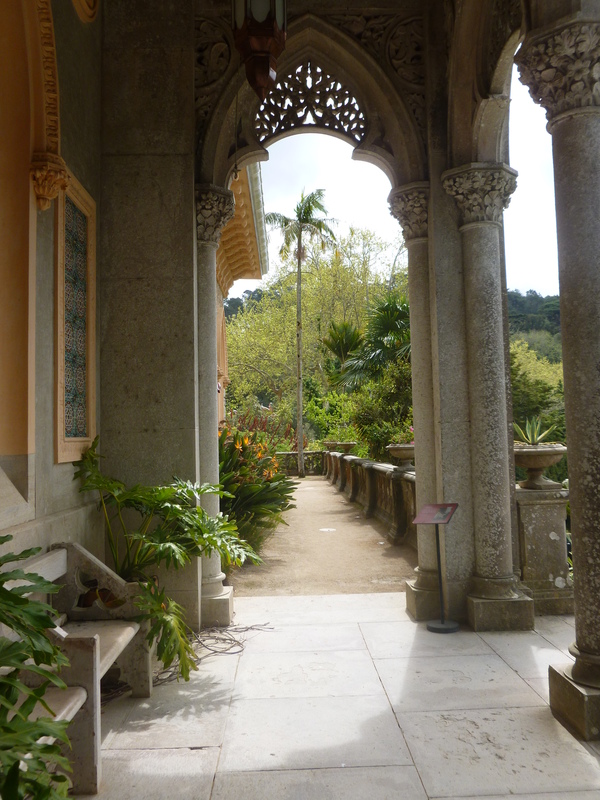 My post this month falls into the “and elsewhere” category of my blog title, as I deserted France to lead a tour around Portuguese gardens near Lisbon and in the Sintra hills. These low mountains sit between Lisbon and the wild Atlantic coast, where the temperate climate, combined with high winter rainfall has created a forested area of rich botanical and ecological diversity. The hill town of Sintra itself has attracted Portuguese royalty and aristocracy for centuries as well as wealthy international traders. 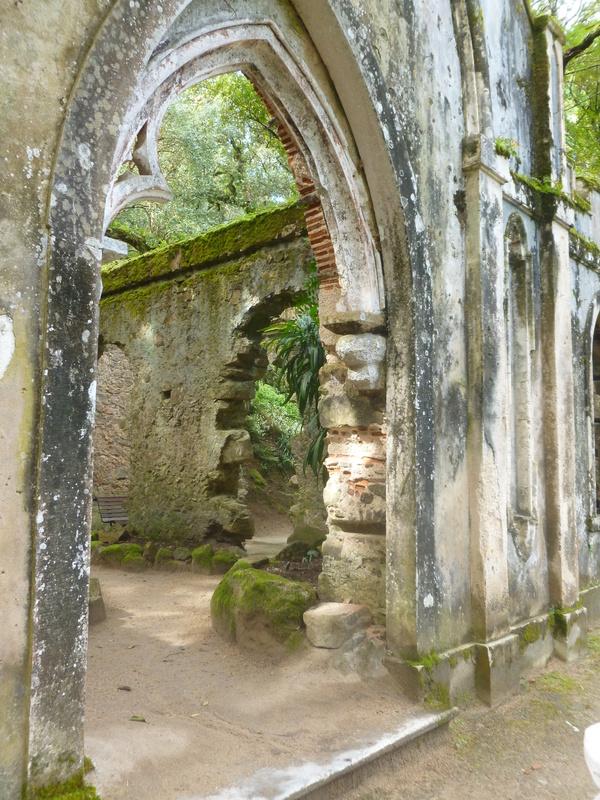 Tucked away in the forests around the town, richly decorated palaces called quintas were built, accompanied by large parks and exotic gardens. The palace and park of Monserrate are one of the finest, and the whole area is now a protected UNESCO heritage site. Gerald Luckhurst, a Landscape Architect working at the park since the 1980s showed us around. His research into the garden has turned up previously undiscovered history and has ultimately earned him a PhD. When Gerald arrived 30 years ago, the whole site had been lost under scrub and invasive acacia trees, but slowly and surely, he and the team at Parques de Sintra began to clear the site, uncovering forgotten paths, finding botanical treasures and recreating views. 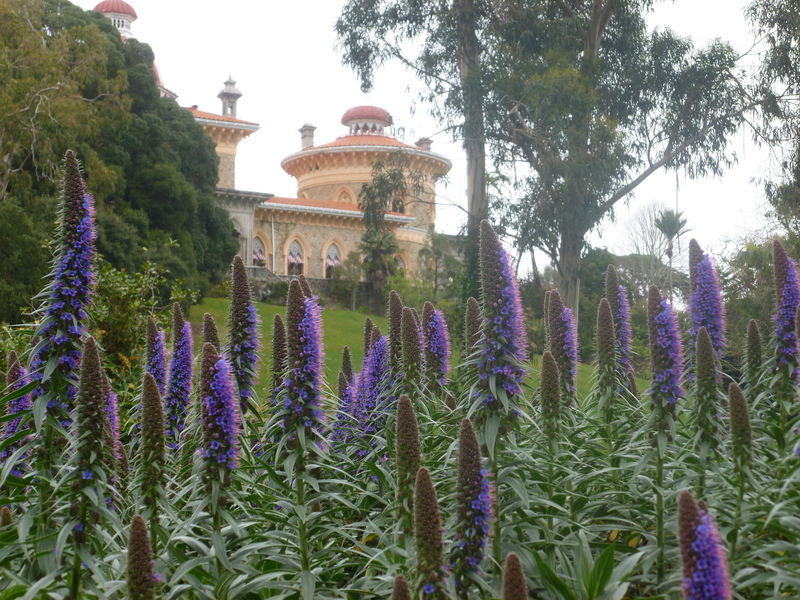 Their work was rewarded when Monserrate was awarded the “Best Development of a Historic Park or Garden” by the European Garden Heritage Network in 2013. The first English inhabitant of Monserrate, Gerard de Visme, was a Londoner of Huguenot descent who made his fortune as a teak and diamond merchant. He built a neo-gothic mansion here and Gerald has recently found evidence that he was aided in the creation of the garden by a mystery Cornish head gardener. They were responsible for building follies including a naturalistic gateway of granite slabs and this waterfall of immense stone blocks. The next resident, William Beckford (1760-1844) was known as the wealthiest Englishman of his time as well as an eccentric builder and he continued to develop the palace and garden. Then in 1856, Francis Cook, an English textile millionaire bought the estate, knocked down the neo-gothic mansion and conceived the present ornate Romantic palace and gardens. 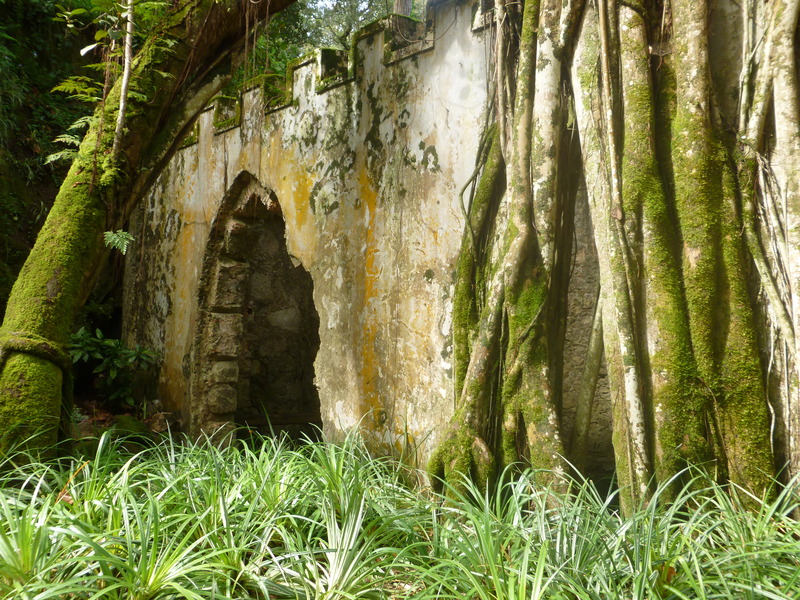 All three of Monserrate’s creators seem to have been keen to add as much romanticism as possible to an already romantic site, and Lord Byron is said to have visited and been inspired to write here. The first part of the garden is a shady forest garden clinging to steep slope. A zig-zag path leads the visitor down the side of the hill, steadily revealing views over the canopies of trees and shrubs below. The trees are a mixture of native oaks, rare protected holly and introduced species such as umbrella pines, Rhododendron arboreum (seen flowering above) and araucaria species. 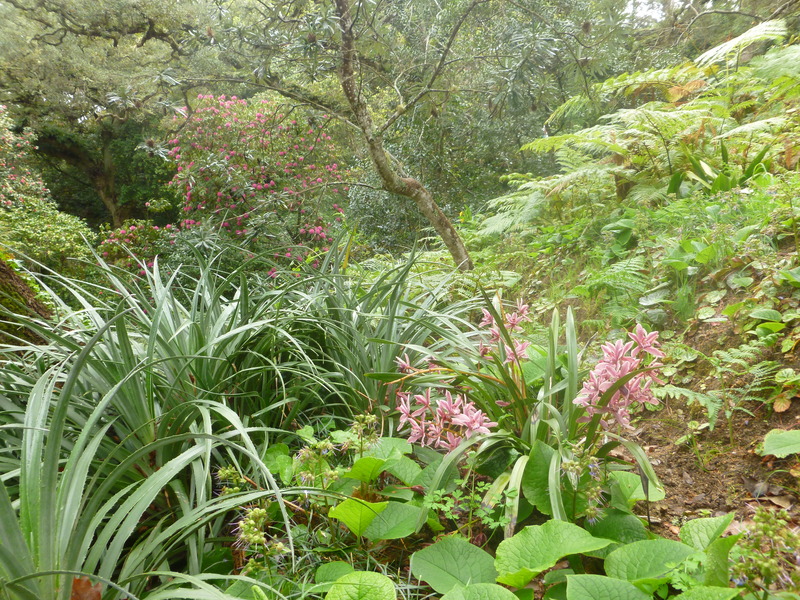 The understorey and ground-cover includes exotics such as bromiliads, monstera (Cheese plant), fuchsias and tree-ferns, mixed at this time of year, with more common natives such as primroses, pennywort and violets. 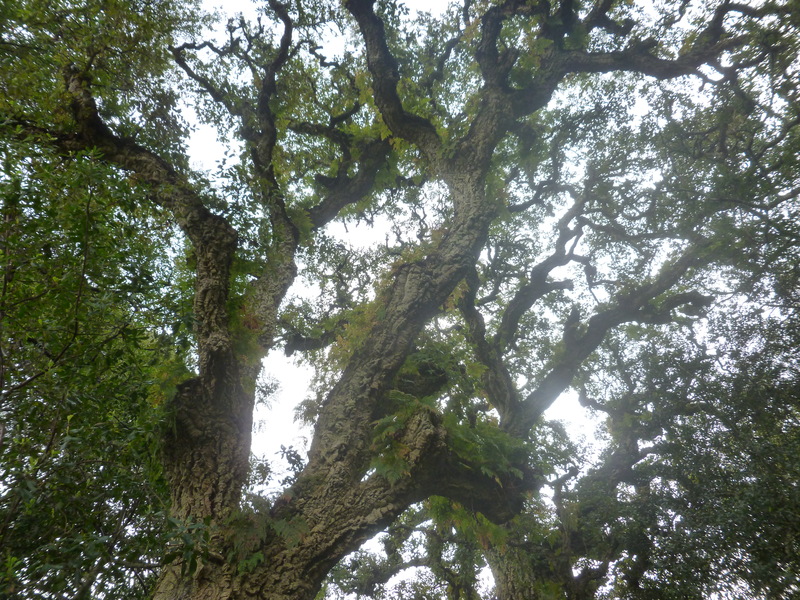 All over the Sintra hills, the cork oaks with their deeply fissured bark, pay host to the epiphytic fern Davallia canariensis, the Hare’s Foot fern. Their ‘furry’ roots anchor themselves into the bark and absorb the water from the moisture-laden air. On the forest floor, self-seeded orchids cohabit with spiky bromiliads and many kinds of fern. A pretty green and pink flowered fuchsia with large leaves; probably Fuchsia fulgens. This building was a folly built by Gerard de Visme in the style of the original neo-gothic mansion; it once had a roof and was used for banquets. Over the years, either from neglect or design, the roof disappeared and the windows were ripped out, making it a ruin. In addition, an Australian Moreton Bay Fig, Ficus macrophylla, has draped its spectacular buttress roots over the building, adding to the air of romantic abandonment. 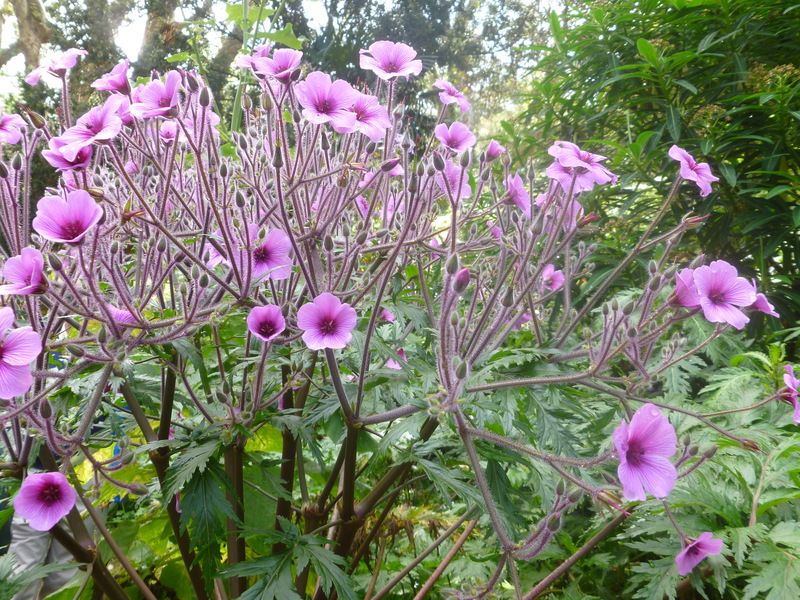 Mounds of Geranium maderense on the woodland floor. 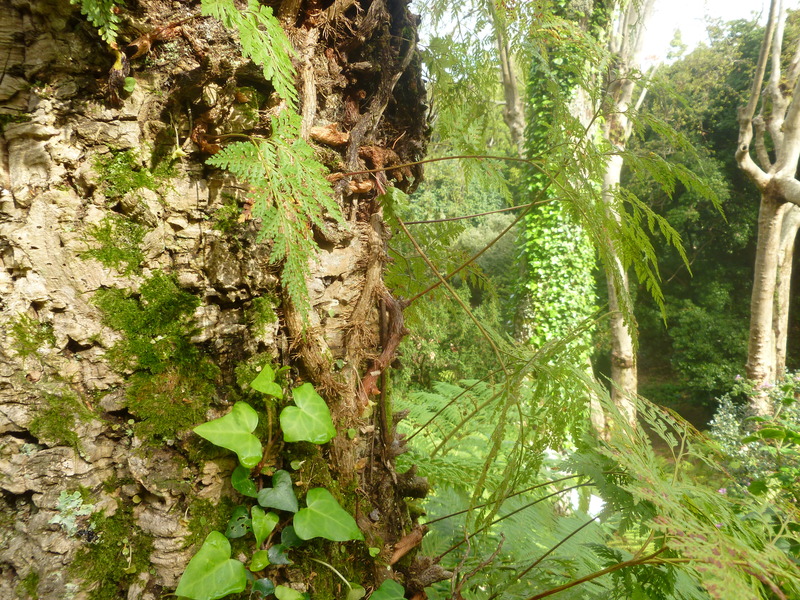 Francis Cook was a big fan of tree-ferns and some of the specimens he planted survived and naturalised here. When Gerald Luckhurst and his team cleared this area of the invasive acacias that covered the ‘lost’ garden in the 1990’s, they found a few survivors. 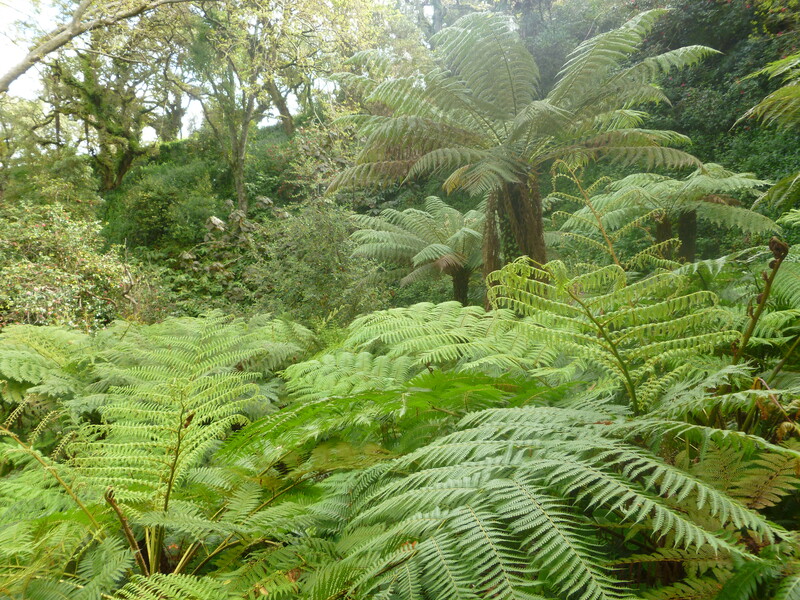 Gerald has since added many more tree ferns to recreate the original fern valley including Cyathea dealbata (the silver-leaf fern of New Zealand) and the slow-growing Dickinsonia antarctica. 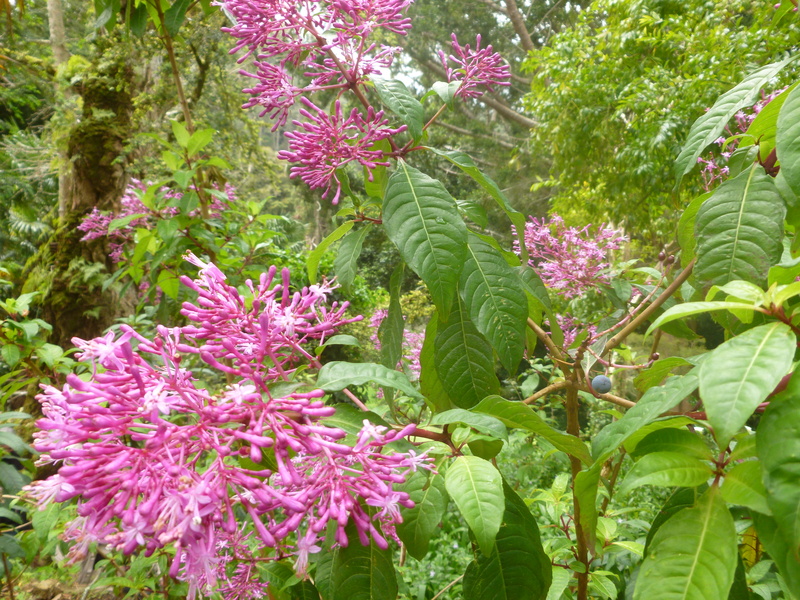 In full flower on the woodland floor, another beautiful fuchsia, F. arborescens. 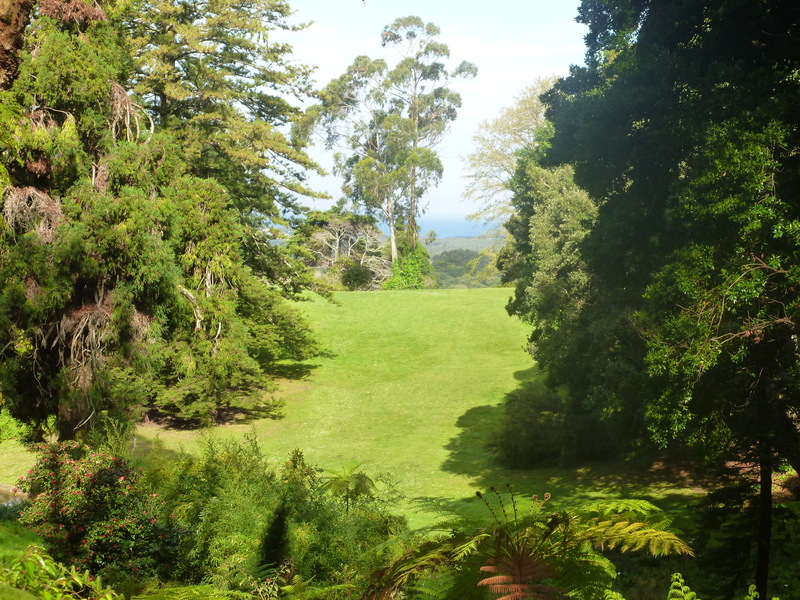 The lawn was reinstated as part of the park restoration and the acacias which totally covered this area were removed, clearing the original view to the sea. On the valley floor, several pools of water were cleared and restored to their former glory. 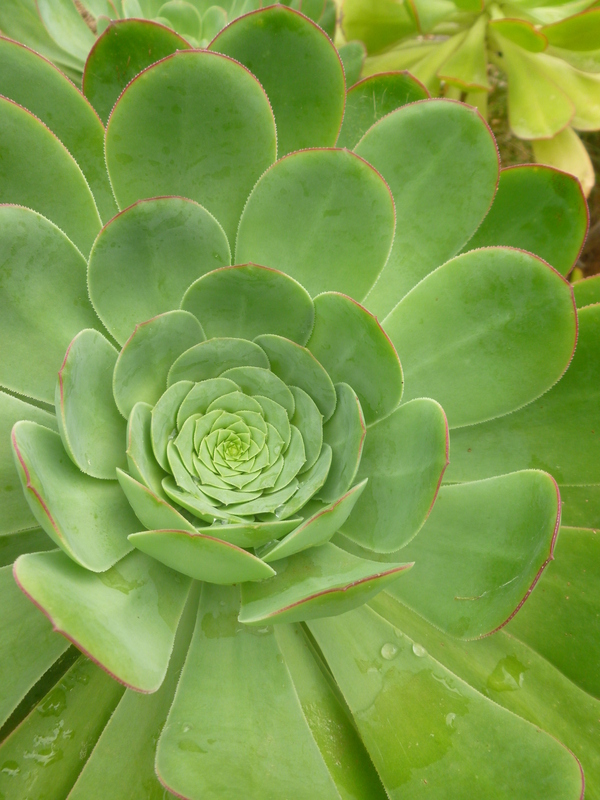 In the South African garden, aeoniums and agaves mingle with self-seeded foxgloves. 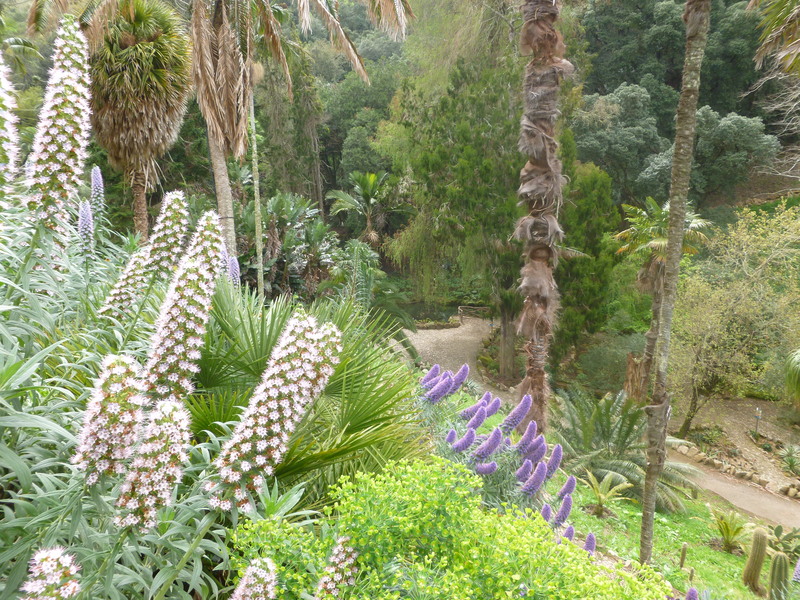 Echiums, euphorbia and trachycarpus species thickly cover the slope down to the Mexican garden in the valley. 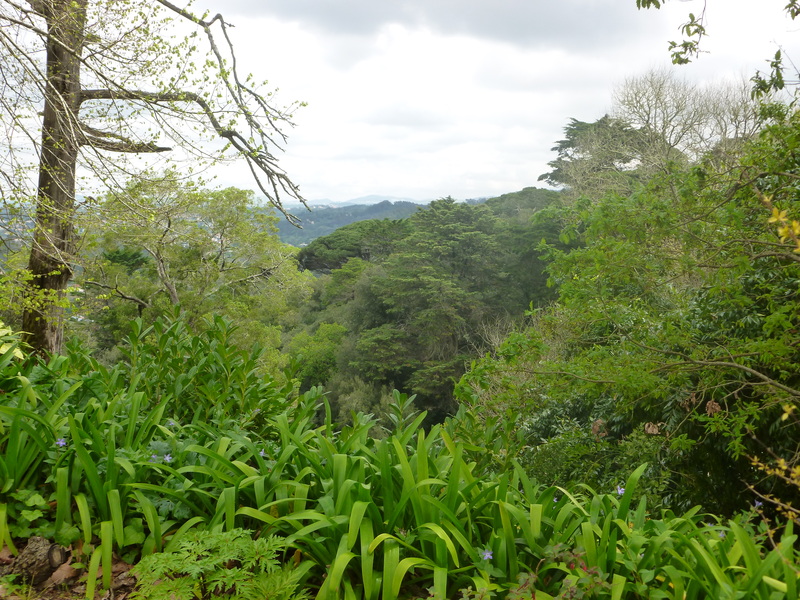 From the highest points in the garden there are spectacular views over the mountains and forest tree canopy. 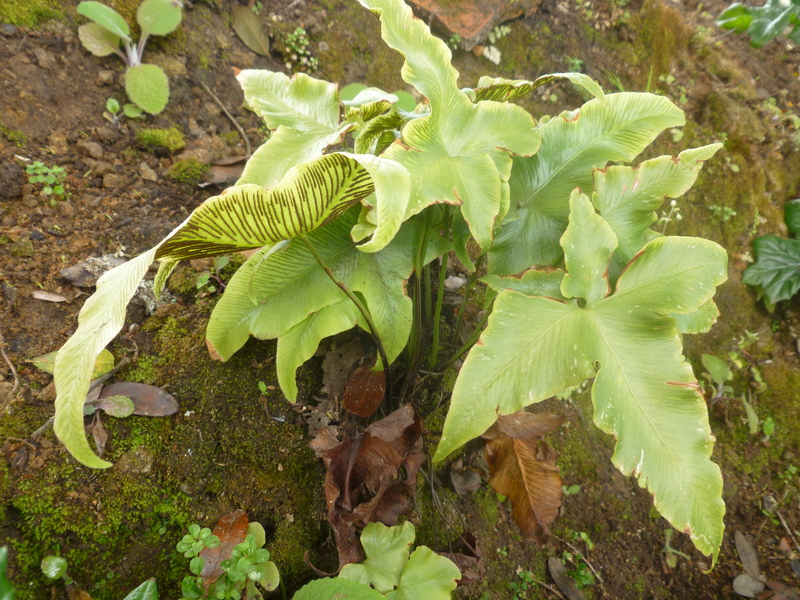 This rare native fern, Asplenium hemionitis or the ivy leaf fern, can now only be found within the Parques de Sintra at Monserrate. 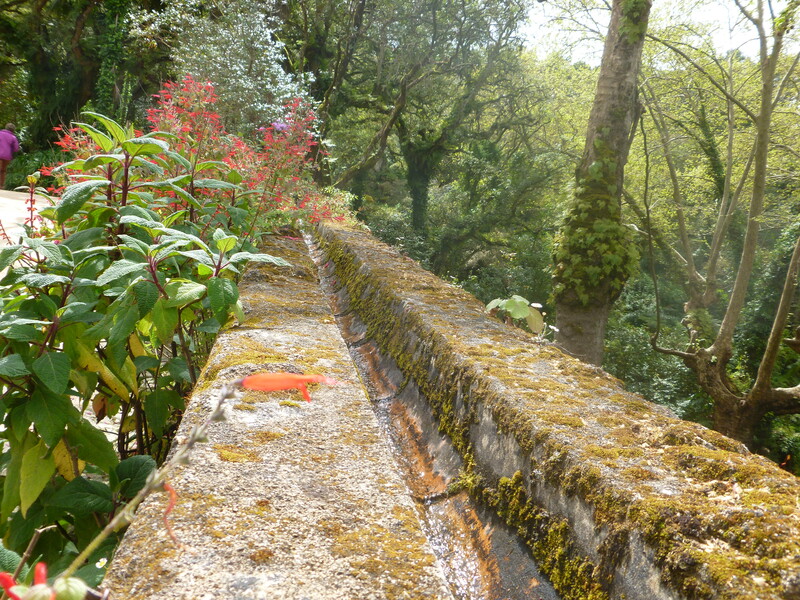 The soil of Sintra is mainly acid and so this fern is found clinging to the stone walls where it benefits from the presence of lime mortar. 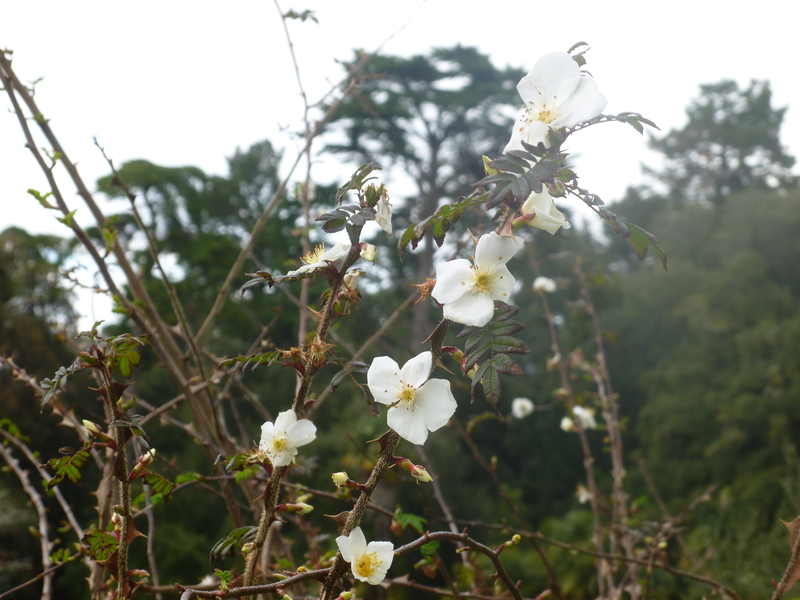 When creating a new rose garden at Monserrate, Gerald Luckhurst decided to create a wilder, informal garden. Ramblers and climbers romp over old tree stumps and into large mounds, creating swathes of colour and perfume and covering a huge amphitheatre shaped slope. This rose, Rosa sericea pteracantha, is known for its magnificent red thorns though Gerald told us that there has been recent discussion amongst botanists as to whether it really is a rose, as the flowers only have four petals instead of the usual five. 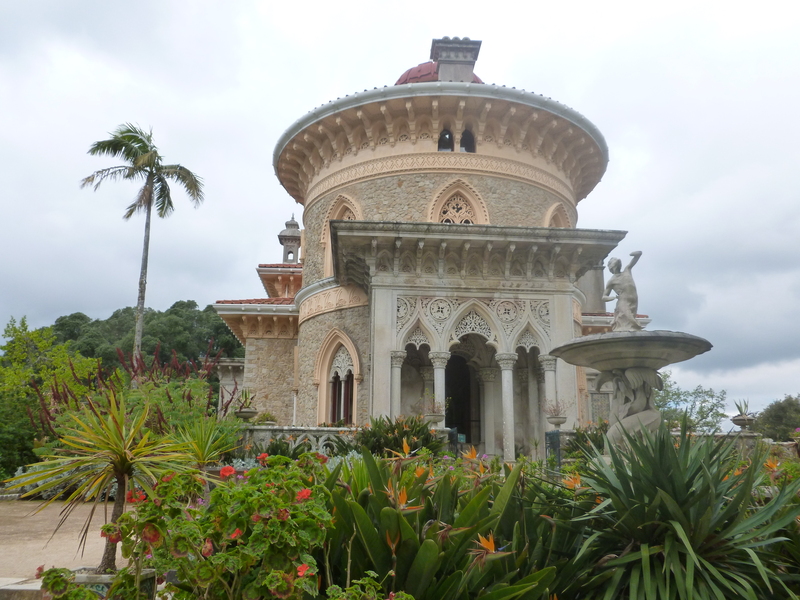 The palace of Monserrate, built by Francis Cook in 1856 as a summer residence for his family, is very eclectic in its style and was inspired by both Indian and Moorish architecture. It is astonishingly ornate both inside and out, with carved stone columns, screens and friezes, decorative plasterwork and marquetry. The veranda to the side of the house perfectly frames an Archontophoenix cunninghamiana palm tree. Built on the top of the hill, the ornately balustraded terrace around the palace has views over the estate. 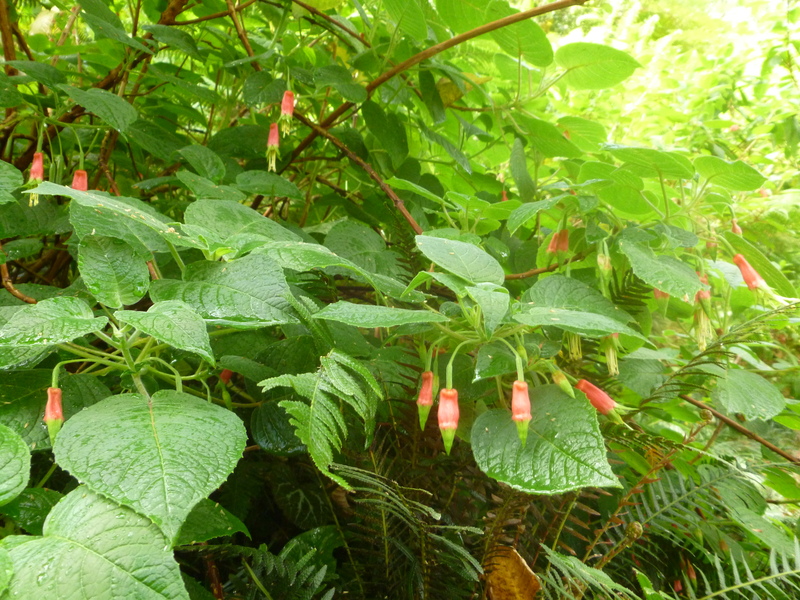 A Beschornia yuccoides in flower with its superb lime-green and fuchsia-pink flower spike. 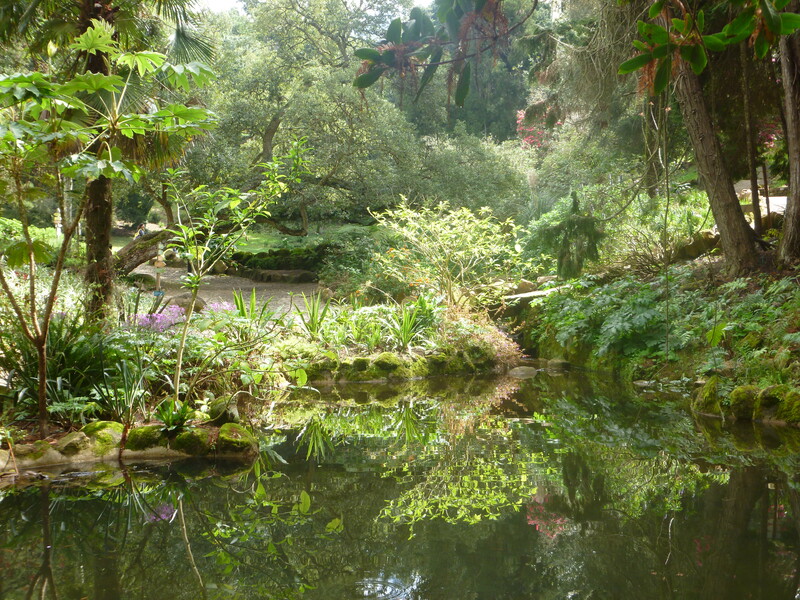 In all the Sintra gardens, water is carefully managed. 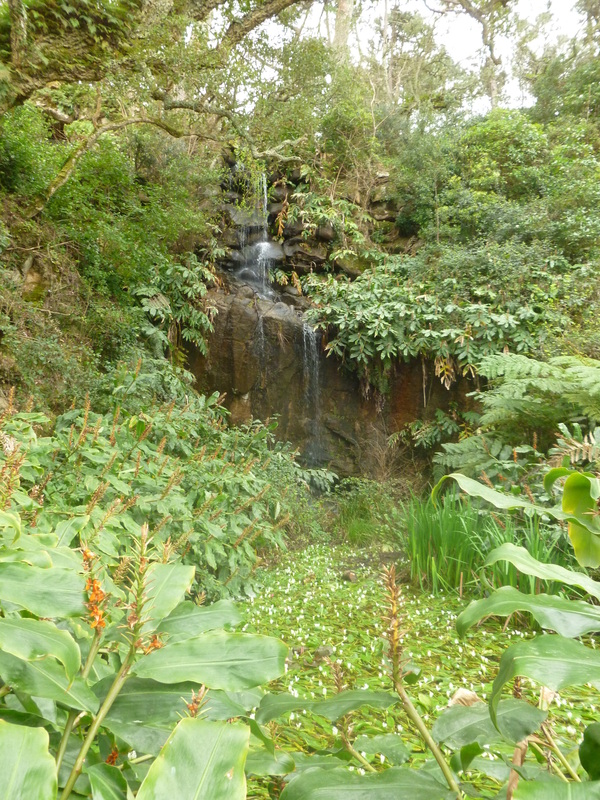 Four large rainwater reservoirs in the forest supply the waterfall and ponds at Monserrate and with such steep slopes the fountains can run on gravity alone, no need for pumps. Throughout the garden are traditional Portuguese water tanks fed and linked by curved ceramic tiles laid end to end. This ensures the garden is watered in time of drought, and the sound of running water adds to the charm of the place. 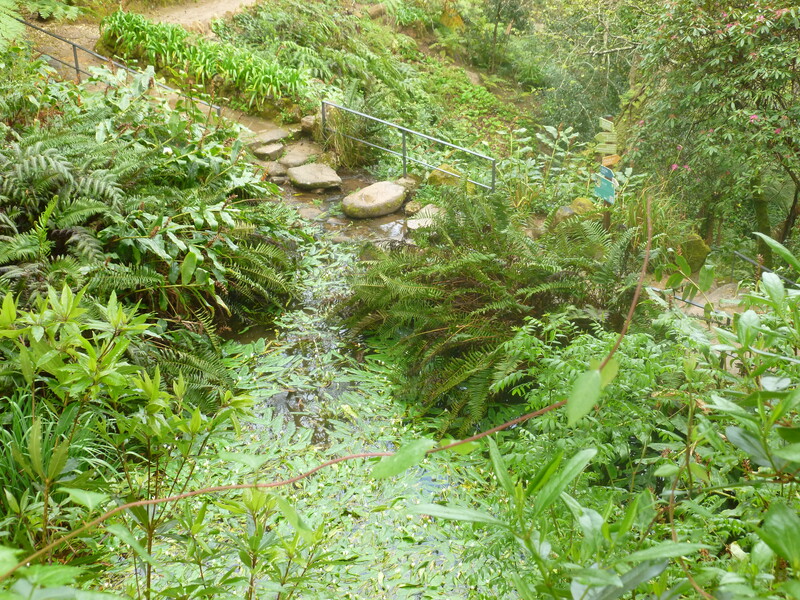 Here, a gully runs along the top of a wall and over a bridge, bringing water to a fountain. The park is large and I’ve only been able to cover some of it here, concentrating on the areas of the garden at their best in spring. 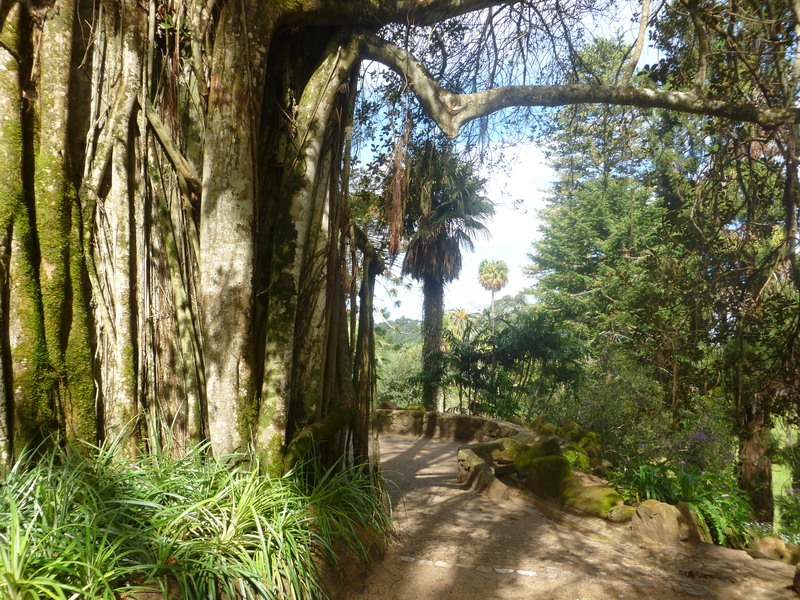 I’ve not included the majestic mature trees including a weeping Taxodium mucronatum, a smooth-trunked Queensland Kauri tree (Agathis robusta) or an immense Norfolk pine (Araucaria heterophylla). 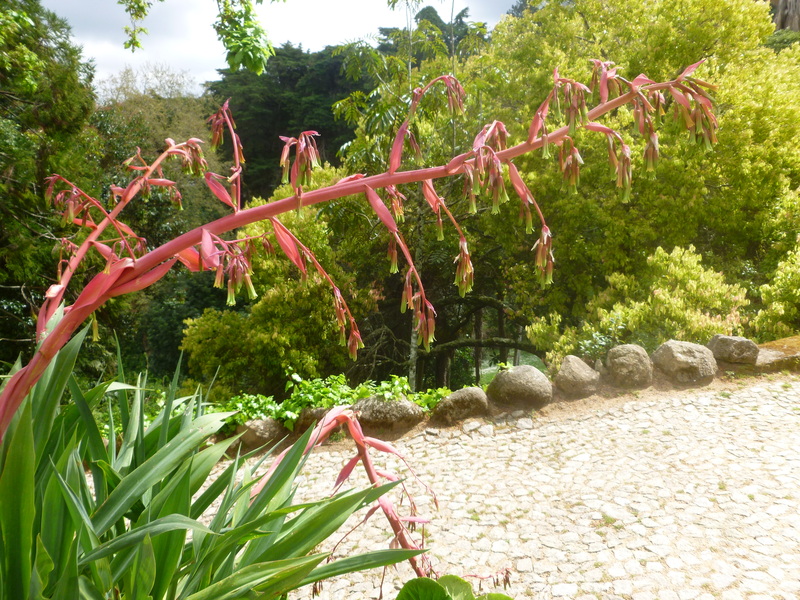 The Mexican garden is marked at its entrance by a five metre tall Strelizia nicolai and as well as being full of cacti and agave, will be sparkling with brilliantly coloured salvias in summer. Monserrate, with its woods, valleys, sunny slopes and views, is wonderful to visit at any time of year, whether in bright sunshine or in the drifts of the atmospheric sea mist that occasionally roll in from the Atlantic. The palace and park are open all year round. For more information on opening hours go to www.parquesdesintra.pt or telephone +351 21 923 73 00. There is a small café selling light meals and snacks. The parks and palaces of Monserrate, Pena and Queluz can be visited on a joint ticket. 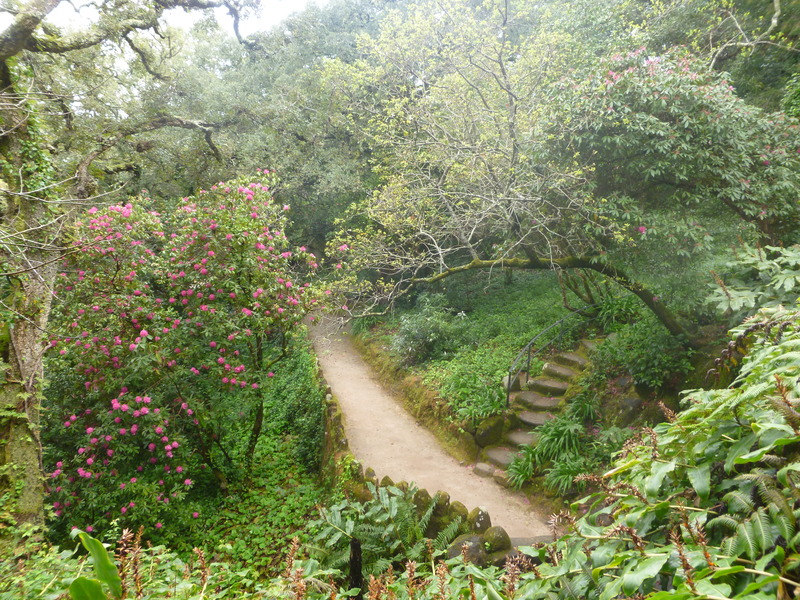 Lisbon and the Sintra hills are a garden lover’s paradise. 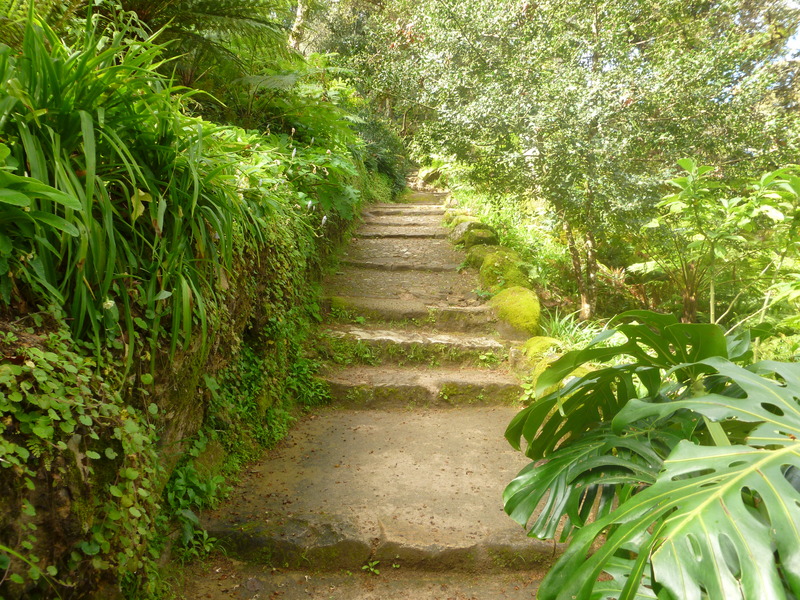 Other gardens to visit near Sintra include the fantasy garden of Quinta da Regaleira and the park of the brightly coloured Pena Palace. Towards Lisbon is the royal palace of Queluz, with formal French-style gardens and elegant lead statues by English sculptor John Cheere. 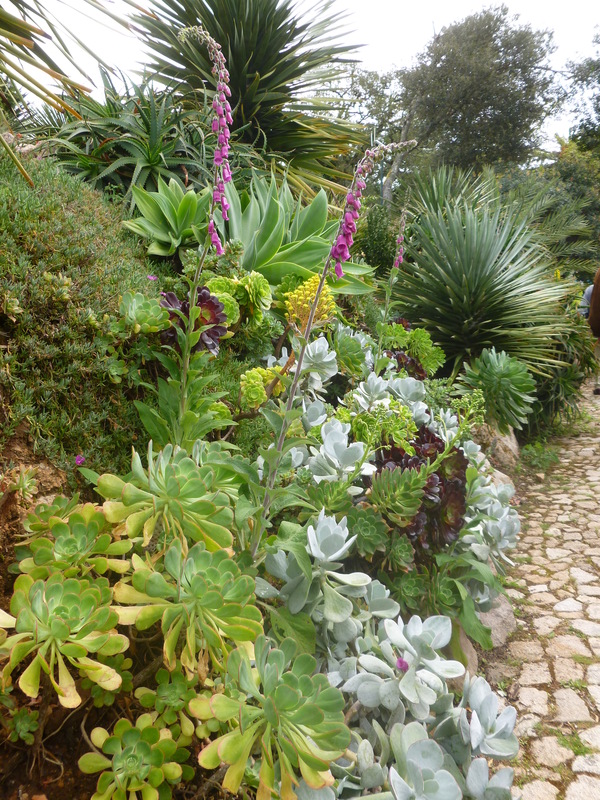 Within Lisbon itself, the garden at Quinta de Fronteira is full of the beautiful ceramic tiles for which Portugal is famous and the botanic gardens of Ajuda and the Estufa Fria, a shade greenhouse are well worth a visit. 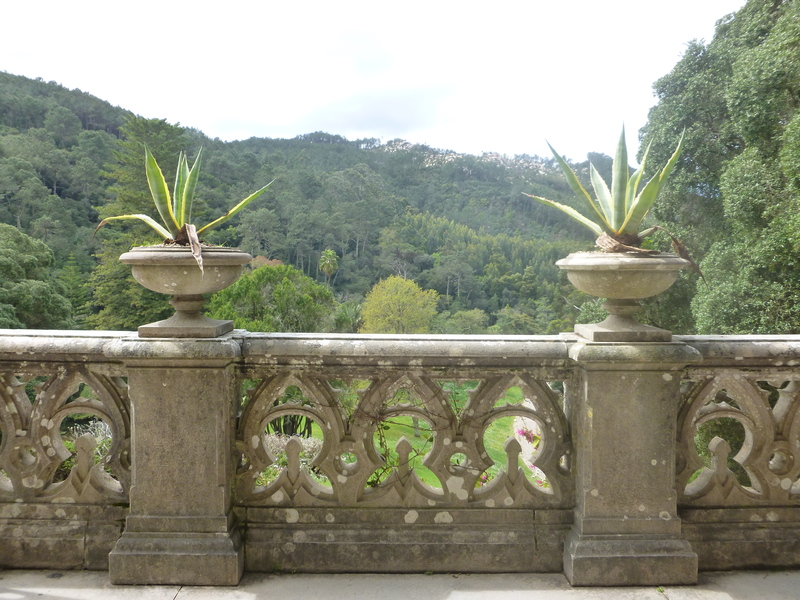 I visited the gardens whilst guiding a Susan Worner tour featuring gardens in Sintra and Lisbon in April 2015. For more information go to Susan Worner Tours. A message for those in my group – my birthday flowers made it safely back to Paris! …. Lynda Harris is a landscape architect and garden designer based in Paris. Thank you. I’d never have known about this garden but for this post. Highly atmospheric is an understatement. I want to visit. I think you may have to plan more than one trip to Europe! Thanks for all your comments James. Mature plants–stronger than architecture–great details–edge of the world–edge of transcendent experience–garden portals–great story. Thank you for sharing! 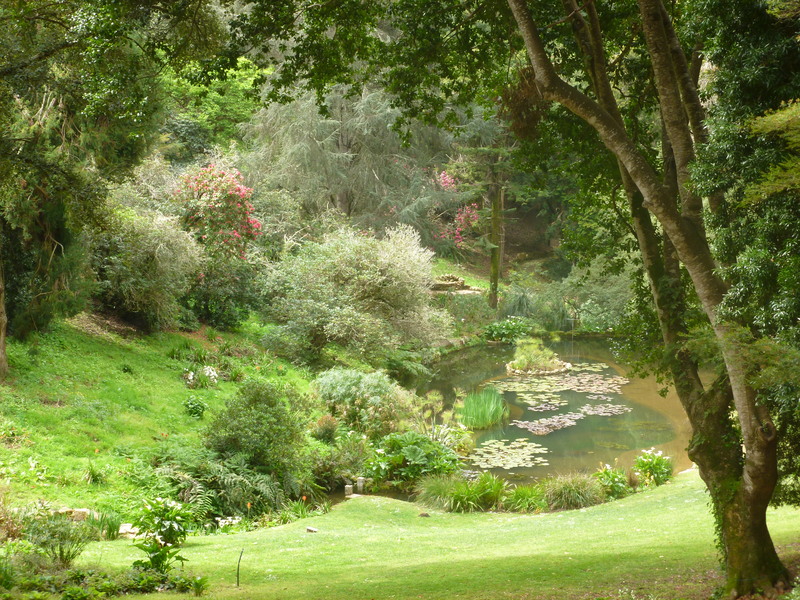 The most beautiful garden in Portugal.